Wow! What an amazing turn out today for the bird walk! About 60 people turned up. 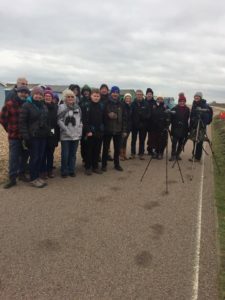 About 60 people turned up for the Widewater Bird Watch on a chilly, blustery, Saturday morning. With so many people, it was necessary to split into two groups: one group started with a sea watch and the other group focused on the lagoon, swapping around after about 45 minutes. And along the beach at least 15 Turnstones. Birding from Shoreham Beach has been outstanding in recent weeks and today was no exception. Two participants had travelled down from Croydon to join the walk and were impressed with what they were able to see and enjoy. It was very positive that three local groups were represented at this event, namely World of Widewater, Friends of Shoreham Beach, and Shoreham and District Ornithological Society. 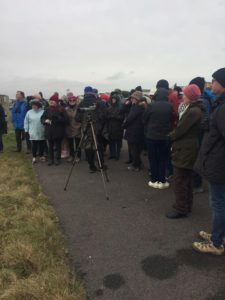 The event succeeded in its objective of showcasing Shoreham’s wildlife and it was brilliant that so many people braved the conditions and saw some really interesting birds. See the Contacts page for details of how to get in touch.